Every day, most boats endure a cycle of temperature and humidity changes, from cool and damp nights to hot, dry bright sun. This expansion and contraction, wet-dry daily cycling, occurring even on days with the best boating weather, takes a toll on gelcoat and wood brightwork. Add salt air, pollution, dirt, rodents, bird droppings, the occasional hailstorm and who knows what else, and your expensive, prized possession is under siege. That’s why a good boat cover is so important. A modest investment in a cover prevents faded and oxidized gelcoat, bleached and cracked wood, mildew and mold. It hides valuable equipment from theft, because what’s out of sight is out of mind. Storage vs. trailering: Storage covers are designed to fit loosely and are best used for protecting boats at anchor, at the dock or when stored on the trailer. They range from a simple blue tarp to a framed canopy (essentially a portable garage made from metal tubing and fabric) or a mast-up mooring cover for a sailboat. Trailer covers, on the other hand, must have a snug fit and reinforcement in high-wear areas to withstand the rigors of traveling at highway speeds. WeatherPro Plus®: Made from gray 3.2oz. Legacy™ marine-grade pigment-coated polyester fabric, with no pocket for the windshield, and no reinforcing patches at the corners. The hem cinches tight using the stretchiness of a sewn-in shock cord. BoatGuard Eclipse®: Upgrade to heavier and stronger 6.25oz. Charcoal/Gray Hot Shot™ acrylic-coated polyester fabric that is more water-repellent and mildew resistant. Sewn-in shock cord in the hem. Semi-custom covers are designed to fit several makes and models of boats with the same hull style. If you own a bass boat, the same model fits a Crestliner, Lund, Alumacraft or Starcraft. One size fits your Mastercraft or Correctcraft competition ski boat. A more forgiving liberal fit accommodates size variations. A custom cover made just for the year, make and model of your boat, and designed to cover its individual accessories, will fit like a custom-tailored suit. It costs the most, but is the easiest to put on and remove, is the best for trailering and will last the longest. There are thousands of patterns available: for example, a cover is available for a 1996 Bayliner 1850 Capri SS with a transom-mounted swim platform and 6" to 18" bow rails. If you own a one-of-a-kind boat or your boat has a lot of unusual options, you may need to have direct measurements taken by a custom canvas shop. They can build to your specifics, but this kind of cover will be the most costly, and may take substantially longer to receive. Fabric properties: Boat cover fabrics need to be the right combination of breathability and water repellency - to keep rain water out, yet allow trapped water vapor to escape. They also need to be UV- and mildew-resistant. Tensile strength and abrasion resistance is especially important in trailer covers as they withstand the rigors of the road. Few materials perfectly meet all the requirements, but coated synthetic fabrics come pretty close to the ideal compromise. Cotton and polyester blends won't last as long as synthetic fabrics, as natural yarns simply don't have high resistance against mildew and UV light. Pigment dyed polyester fabrics have a good strength to weight ratio and are an excellent choice because it is strong and breathable, yet it repels water and stands up to UV radiation. A good yet economical choice when choosing a synthetic fabric is Hot Shot™ , an acrylic coated polyester. Two other popular, durable and practical choices are urethane coated, solution dyed polyester fabrics such as Ultima™ or solution-dyed acrylics like Sunbrella™ , both of which are breathable, stain-, UV- and mildew-resistant and shed water well. Trailerite® Semi-Custom: Hot Shot™ polyester fabric is the chosen fabric. It represents the best combination of features, performance and price. This rugged acrylic-coated polyester is available in six colors. If you own a traditionally built wood boat this fabric is a good choice, but to help control wood's expansion and contraction, these owners may want to also install extra vents in their covers, such as the Taylor Boat Vent II (Model 5378575). Trailerite® Custom covers are available in Hot Shot™ and 7oz. Ultima™ urethane-coated polyester. The most durable and UV-resistant material, Ultima™ is the best choice for hot and humid climates, and is available in six colors. Custom covers, regardless of fabric, include sewn-in reinforcements at all wear points and use 1/4" nylon rope in their hems, with adjustable Rope Lock tensioners. All the covers, both semi-custom and custom, ship within five working days, so there is no extra wait for the best quality cover. Colors and dye: We recommend dark colors, which at first may sound surprising. But the higher amount of dye in dark materials increases a fabric’s UV resistance and contributes to its longevity. Blue, black and green last longer than white, tan or red. Of course, darker colors also absorb more heat, and transmit it to whatever is under them. Support your cover to keep water, leaves and other debris from collapsing it. Shown is an adjustable support pole. What's the easiest way to order? 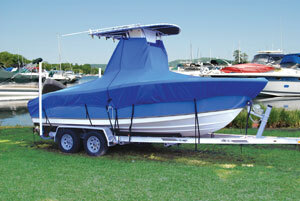 If you own a production boat, check the Boat Cover and Bimini Top Selector on our web site. With it, you can find custom and semi-custom covers. Note the Taylor part number and match it to the Model number, or call 1-800-BOATING to order. Make sure you include all the equipment you want to cover in your measurements. If the cover is too big it will sag under the weight of rainwater, which collects in the low spots. Oversized covers also billow in windy conditions, increasing the risk of snagging and tearing on sharp objects. If the fit is too tight, seams and fabric are subject to disproportionate stretching, which also leads to damage. Sometimes we see boats being towed on the freeway with their storage covers wildly flapping in the breeze. This practice is unsafe, reducing the driver’s visibility to the rear and endangering others. For safety’s sake, please use enough tiedowns or remove storage covers altogether if you take public roads and travel at high speeds. 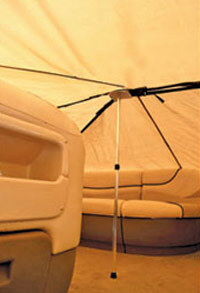 The snugness of the cover is the single most important factor for insuring a trouble-free boat cover life. Each and every tiedown loop must be securely tied to the boat or trailer using rope, shock cord, or straps. Note: If tying off to your trailer, the boat must also be rigidly fastened to the trailer. Before tightening, the cover must be properly supported and padded. 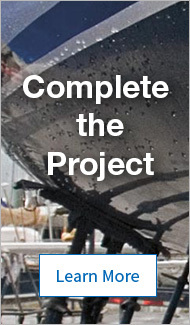 Protect the sides of your boat from hooks or buckles that may scratch the finish. If using shock cord, be sure it is heavy enough so the cover does not billow when trailering. Fabric straps must be resistant to sunlight and exposure. Be careful using ratchet-type tighteners. They can place undue stress on the cover and shorten its useful life. Wash your cover with mild soap or detergent. Shake out dust, use a garden hose to rinse off dirt, or use compressed air for stubborn dirt. Do not use a scrub brush, put into the washer or dryer, use bleach or harsh astringents. Line dry.